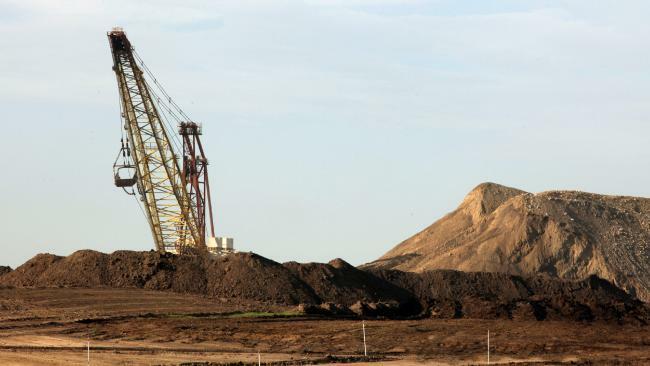 REGIONAL Queenslanders are strong backers of the state's coal industry and want the proposed Adani mine to go ahead, new polling has found, but they are wary of taxpayers footing the bill. A ReachTEL poll across four federal electorates stretching between Rockhampton and Townsville found powerful support for the coal industry. More than 80 per cent of both men and women agreed that jobs generated by coal are important for the region. 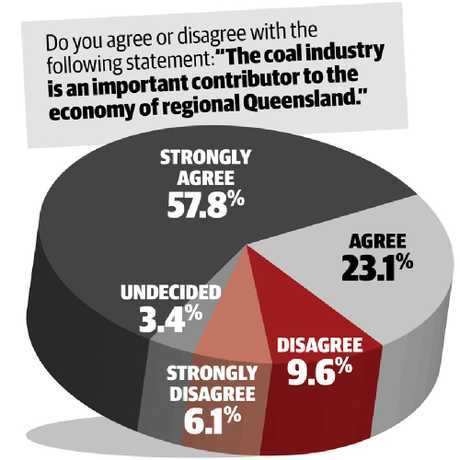 The polling - conducted by the mining industry this week - also found that when asked to agree or disagree with the statement "the coal industry is an important contributor to the economy of regional Queensland'', 56.8 per cent of women and 58.8 per cent of men strongly agreed. The polling gauged support for the coal industry and the Adani project in the Queensland electorates of Capricornia, Dawson, Flynn and Herbert. Across political lines, LNP voters (74.9 per cent) were the strongest supporters of the statement followed by One Nation, (71.2 per cent) Labor (41.9 per cent) and Greens (20.4 per cent). Just over 60 per cent of men and women also strongly agreed that jobs generated by the coal industry were important for regional Queensland while a mere 6.3 per cent of women and 5.2 per cent of men strongly disagreed. The overwhelming majority of those surveyed were aware of the massive Adani thermal coal project proposed for the north of the Galilee Basin in Central Queensland. 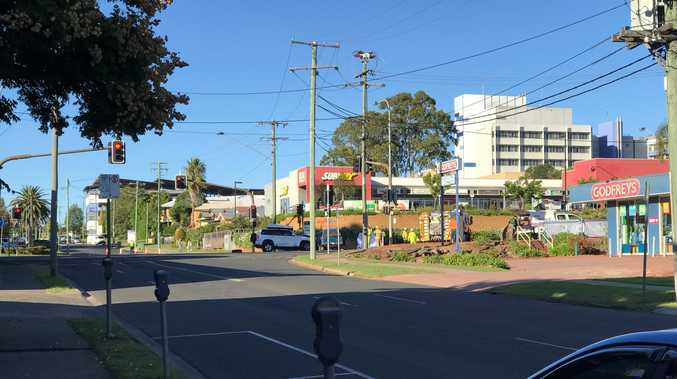 The project, representing a $16.5 billion investment and estimated by Adani to be capable of creating 10,000 jobs in regional Queensland, has the support of more than 60 per cent of those surveyed. 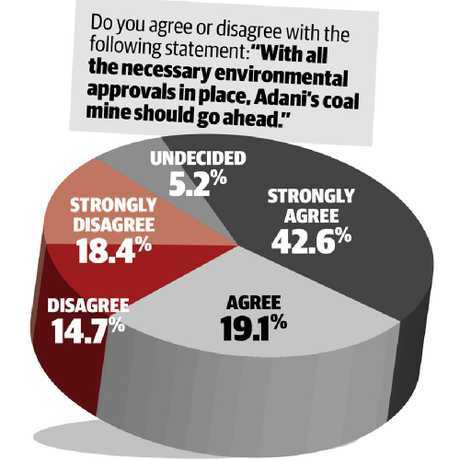 Women (61.7 per cent) and men (61.6 per cent) agreed or strongly agreed that the Adani mine should go ahead, provided all necessary environmental approvals were in place. But more than 50 per cent of men and women opposed or strongly opposed the use of taxpayers' funds to assist mining projects. 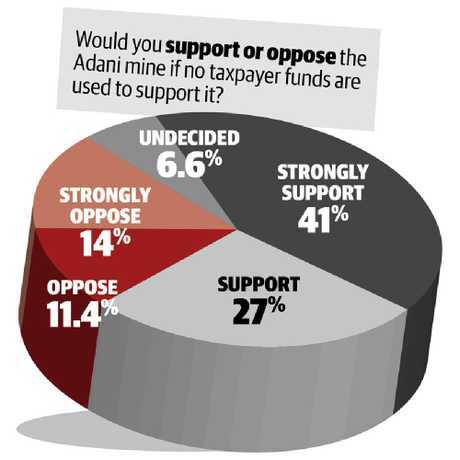 Across political lines, it was Greens voters who were most strongly opposed to the use of taxpayer dollars to help get mining projects underway. More than 80 per cent of Greens voters were opposed, while Labor voters (70.8 per cent) were either strongly opposed or opposed. But, take out taxpayer support, and the vast majority of women (65.3 per cent) and men (70.7 per cent) either supported or strongly supported the Adani proposal. THE "job robbers'' spreading lies about wealth-producing mining projects have to be confronted, according to the state's peak mining group, which has declared war on environmental activists. Analysis of key environmental groups by the Queensland Resources Council has found they include 386 full-time paid positions in Queensland and interstate. Queensland Resources Council chief executive Ian Macfarlane says he has had enough of the propaganda "and, quite frankly, lies'' spread about major projects such as the Adani coal mine. He alleges green groups have access to massive budgets which can mobilise public relations exercises, and he wants authorities to closely monitor the activities of activists if they break the law. "If they want to protest … they should abide by the law as our sector does and every other citizen is expected to do," Mr Macfarlane said at an industry conference this week. 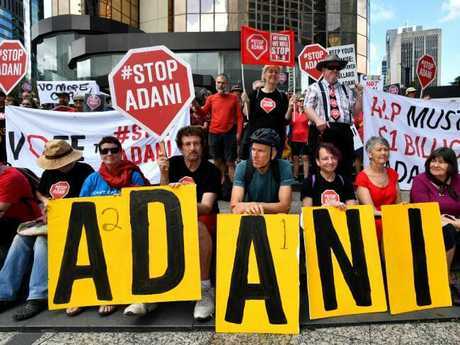 Inner-city protesters have pressured the Federal Government and Opposition over their support of the Adani megamine. "I call on all of you in this room today … to roll up your sleeves and help us fight this goliath masquerading as David. We can't do it alone, we need everyone to pull together, we need your help." The Australian Conservation Foundation, named by Mr Macfarlane as an activist group with an annual income above $13 million, said it would make no apology for advocating for clean air, clean water and a safe climate. "This is standard inaccurate rhetoric from Mr Macfarlane, who is ultimately paid to spruik the interests of some of the world's biggest and wealthiest mining companies,'' ACF chief executive officer Kelly O'Shanassy said. "We recognise that responsible mining is possible and there are responsible mining companies. But you cannot have it both ways on climate change. If we are to keep global warming to relatively safe levels then the scientific research clearly shows the vast majority of known coal, gas and oil reserves must remain in the ground."